The majority of websites are using Google Analytics for tracking and reporting (W3Techs report 82.9% of tracked sites are using Google Analytics). Since launching Google Analytics in November 2005 the Internet has radically changed moving away from static content to fully interactive web applications. Google have addressed this with the integration of event tracking and other collection techniques, including deployment within mobile apps. As Google Analytics continues to evolve there are a number of features and use cases you might not be aware of. This presentation is designed to highlight some of the emerging Google Analytics hacks which will hopefully inspire you to look at your analytics problems and opportunities in new ways. For example, we look at how Google Analytics can be used as part of the Internet of Things, using low cost computing like Raspberry Pis for recording and analysing everything from sensor data to physical switches. We also look at bridging offline and asynchronous tracking sending measurement data in batches when connectivity is re-established as well as pushing data from third party APIs into Google Analytics using free tools. Slides are also available (embedded below). This talk heavily leaned on a slides and work by Nico Miceli who is a Google Developer Expert in Google Analytics and who I also teamed up with on a Google Analytics for Learning Analytics session for RMIT University. I was nervous talking to a crowd of institutional web managers about Google Analytics in case they already knew everything that’s useful. In the end I felt I was able to highlight some features of GA that the audience wasn’t aware of which also hopefully inspired looking at their analytics with some new ideas. As well as the talk I also gave a workshop on setting up and using Google Analytics which focused on Google Tag Manager. For the workshop I turned to the work of another Google Developer Expert in Google Analytics, Simo Ahava. 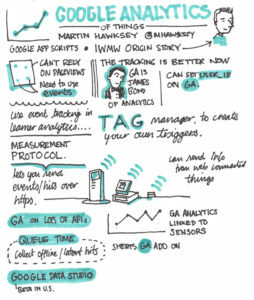 If you haven’t heard of Google Tag Manager and you administer Google Analytics accounts I strongly recommend you find out about it and Simo’s #GTMTips are also essential reading.